← Guest Blog and Character Interview with Alex McGuire from Carly Jordynn’s latest novel! RELEASING THE DEMONS now available for preorder! 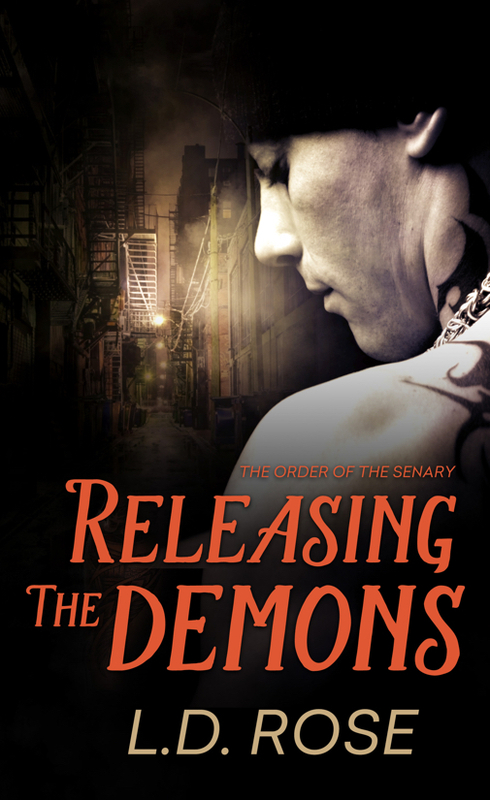 RELEASING THE DEMONS is now available for preorder! \o/ YAY! I’ll also be doing a blog tour over the next few months along with a Facebook party towards the end of September so stay tuned for the madness! Blaze Knight has been through hell and back, but the nightmares aren’t over yet. Motivated by her sister’s gruesome death, Valerie has made it her life’s goal to bury every vampire in the ground where they belong. When she brings in Blaze Knight for suspected murder, she discovers he’s not only innocent, he isn’t a man at all—he’s a half-vampire hybrid working with a band of brothers for the U.S. military. Valerie has a hard time trusting anything with fangs, yet she quickly falls headlong into Blaze’s life, a life full of darkness and horror she can’t even begin to fathom. The bodies are stacking up, but Valerie can’t seem to let go of this hybrid, a beautiful monster filled with pain, rage, and passion unlike anything she’s ever known. Valerie kept her eyes locked on the glass windows covered with cigarette prices and beer ads, watching Tattoos pay up at the cash register. Once she reached the side of the building, she pressed her back against the warm brick wall. Sweat trickled down her spine and she wiped her clammy hands on her jeans before she drew her Beretta. She listened for the bell hanging above the store entrance, and when it jingled, she peered past the corner of the building. Holding a pack of Marlboros, he slipped it into his back pocket along with a silver money clip. He walked back toward the Chevelle, scanning the area one more time as he stepped off the concrete elevation. This is it. Do it. Now! Gasps and shouts resounded as everyone turned their attention on her. Some people ducked while others gawked, and she wished they would just climb into their cars and get the hell out of here. She did her best to ignore them, keeping her focus solely on the man before her as she carefully approached him. He didn’t make any sudden movements, his brow furrowing as a muscle in his jaw ticked. She closed in on him, his presence becoming more and more overwhelming. Sirens resonated in the distance, sending a trickle of relief through her. He didn’t appear armed but that didn’t mean jack. Anger consumed the confusion on his face but he surprisingly complied, giving her his back again before dropping to his knees with his hands above his head. She kept her gun aimed and her mind submerged in the well of her calm. She couldn’t remember the last time she’d arrested someone; she usually shot to kill. “Cross your ankles,” she ordered, and he did so, crossing his booted ankles as if he’d done this before. Valerie placed her foot in the space between his legs, so if he attempted to stand he would end up flat on his face. People finally backed away as she removed her tungsten carbide handcuffs from her utility belt, gripping the Beretta with knuckles white as chalk. Tungsten carbide was the only metal strong enough to hold a vampire, but she used it on everyone, regardless of species. Two New Rochelle cruisers whipped into the gas station, blocking off both exits before four officers leapt out of their respective vehicles. Valerie put the gun up and cuffed Blaze’s dominant hand, swinging his right arm around before latching onto the left. He didn’t put up a fight. He didn’t even flinch. But he balled his big hands into fists at his back. She read him his Miranda rights as she cinched the cuffs around both of his thick wrists. “I have the right to know what’s going on,” he growled, showing her his savage profile. She yanked the chain of his cuffs, bringing his solid body against her as the faint scent of cologne tickled her nose. She leaned into his ear, anger flashing through her as she thought of bloody grass and charred flesh. This entry was posted in Uncategorized and tagged books, coming soon, dark PNR, ld rose, new release, novels, paranormal romance, reading, superheroes, urban fantasy, vampires, writing. Bookmark the permalink. 17 Responses to RELEASING THE DEMONS now available for preorder! Oh Shey, thank you! 😀 hopefully stuns in a good way, lol. Yay!!!! \o/ many times over. So exciting to finally see a date set and all that fun stuff Eeee! So cool ! \o/ Nikki! I’m terrified, lol. 😉 definitely excited though! Woohooo!! More and more real by the day! Reblogged this on Tracey A Wood 'The Authors Blog'. Ordered my copy!! So excited for you and can’t wait to read it! I just preordered on Amazon, sounds tintillating! Congratulations!